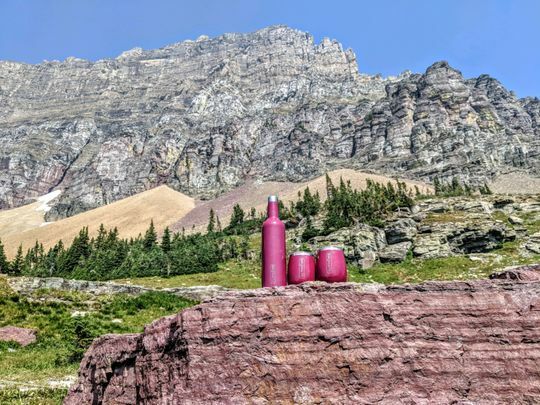 Each gift set includes our triple-insulated 25oz wine canteen and two 14oz wine tumblers designed to keep your drinks at the perfect temperature from the first sip until the last. No metallic taste. Perfect for travel. Want to know how our products will come to you? Check out this unboxing video! Use this handy chart for an idea of your product's size, weight, and shape. Shanon A. Reviewed by Shanon A. Took on a 3 hour hike in 80+ degree weather. The wine was still the perfect temperature when we stopped to enjoy it! The lids were great for keeping "nature" out of our wine. This is a camping/hiking must have! I bought myself a set last year and bought another set as a gift this year. I love the glasses w/kids for traveling and they are perfect! I like everything about the brumate bottle and glasses. This ended up being a gift, so I can't put a review for it. But I do plan on purchasing my own set one day.